Co-founder of the Dallas School of Creative Arts in 1933 and one of the founders of the Craft Guild of Dallas in 1948, Velma Dozier was dedicated in her pursuit of complicated metal techniques and their incorporation into unique and well-made metalwork and jewelry. Born in 1901 in Elm Mott, Texas, a small town north of Waco, Velma moved to Dallas with her family in 1919. he enrolled in Aunspaugh Art School for a class in china painting, where she first met her future husband, artist Otis Dozier. In 1920, she enrolled at Southern Methodist University in Dallas, and later the College of Industrial Arts (now Texas Woman's University) in Denton where she took a metalworking class as an elective. Velma received her Bachelor of Science degree with a major in painting in 1932 and an M.A. in painting from Columbia University in 1933. Upon her return to Dallas from Columbia, she set up a metalworking shop and gallery at 2714 Greenville Avenue with her friend Esther Webb. In September 1935, they held their first open house for the Dallas School of Creative Arts, inviting the public to visit the facility complete with laboratory and gift shop. Shortly thereafter, their school became a center for classes, exhibitions, parties, and a place to meet and socialize with other artists. In order to improve their metalworking skills and learn new techniques, Velma and Esther attended the Stout Institute in Menomonie, Wisconsin in the summer of 1936. After the instructor's initial skepticism at two women in his class, they eventually proved themselves by perfecting difficult techniques, and the male students nicknamed them "the lady blacksmiths." In 1940, Velma and Otis Dozier were married at the Dallas School of Creative Arts, and they subsequently moved to Colorado where Otis resumed his teaching duties at the Colorado Springs Fine Arts Center. In 1945, they returned to Dallas and settled into the Greenville Avenue school location, where they turned the upper floor into an apartment and Velma continued to do metalwork. In 1948, along with several other artists, they turned the school into the Craft Guild of Dallas, a community-supported organization for artists. Velma won several awards in the 1950s, including first prize for jewelry given by the Neiman-Marcus Company and the Linza Brothers Prize at the Annual Texas Crafts Exhibitions at the Dallas Museum of Fine Arts (now the Dallas Museum of Art), as well as invitations to show her work at the Laguna Gloria Museum in Austin, Texas and the Museum of Contemporary Crafts (now the Museum of Arts and Design) in New York City. Travels to Turkey, India, Thailand, Japan, and Mexico in the late 1950s and early 1960s energized and informed her design, as she pursued new metal techniques inspired by the traditions of the cultures she had encountered. Her work continued to win prestigious awards throughout the 1960s, and in 1974 the Dallas Museum of Fine Arts presented the exhibition A Salute to The Doziers of Dallas. Their work, displayed side by side — Otis's drawings and sketchbooks, and Velma's jewelry and metalwork—demonstrated that both were intensely focused artists who respected each other's craft and allowed each other to develop independently through the years. Velma Dozier is best known for her silver and especially gold jewelry. Greatly influenced by Alexander Calder, many of Dozier's pieces are kinetic, having various parts which move when worn. 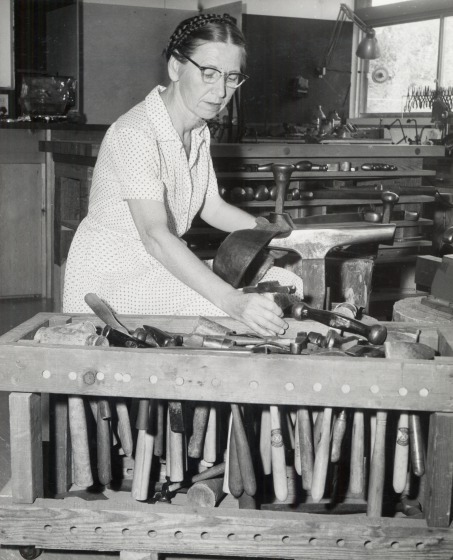 Through her teaching and work, Dozier and her work greatly influenced many Dallas area metalsmiths in the Dallas area between 1935 and 1965. The largest repository for her jewelrywork is the Dallas Museum of Art, which owns over two dozen pieces by her, as well as those of her associates and students. A Salute to The Doziers of Dallas. Dallas Museum of Fine Arts, September 20- October 27, 1974. Dallas: Dallas Museum of Fine Arts, 1974. Ellen Buie Niewyk. "A Lady Blacksmith: The Jewelry and Metalwork of Velma Davis Dozier," Legacies volume 16 no.2 (Fall 2004): 24-34. Charles Venable. Dozier obituary from DMA library artist file, 1988. Clips of Velma and Otis Dozier talking; Audio program from Dozier exhibition?